SKOKIE, Ill. (June 21, 2018) – 36-hole leader Jeff Doty has won the Western Junior hosted by Evanston Golf Club after heavy rains cancelled Thursday's the final round. With the win Doty, a rising sophomore at North Florida has earned an invitation to the Western Amateur to be contested from July 30-August 4. Doty combined rounds of 69-64 to finish 7-under and one shot in front of Stanford commit Karl Vilips. After sharing the lead following the first round Vilips has now finished second two years in a row. Play did begin briefly on Thursday and each group played at least three holes before play was halted for good at 9:14 a.m. 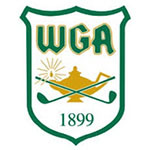 Tournament organizers waited as long as they could to see if play could resume before ultimately cancelling the final round at 4:45 p.m.
Jeff Doty, of Carmel, Indiana, seized the lead Wednesday at the 101st Western Junior by shooting a 6-under 64 at the 6,793-yard, par-70 Evanston Golf Club to stand 7 under after 36 holes. An incoming sophomore golfer at the University of North Florida, Doty started off strong with five birdies and no bogeys on his first nine holes. One back is last year’s runner-up and the No. 1 player in the AJGA Rolex Rankings, Karl Vilips, of Perth, Australia. The co-leader following the first round, Vilips, a Stanford commit, made his charge after driving the 322-yard, par-4 fifth hole — his 14th — that resulted in a two-putt birdie. Ensuing birdies at No. 6 and No. 8 landed him at 6 under and solo second. But the best round of the day belonged to Will Thomson, of Naples, Florida. The Texas verbal commit carded seven birdies and no bogeys on his way to a 63, which is the competitive course record on the Donald Ross design. Thomson missed only two fairways and one green in regulation. Thomson, who began the day at 2 over, now sits 5 under and two off the Doty’s lead in third place alone. The cut came at 2 over, and 44 players advanced to Thursday’s final 36 holes. Brian Stark, of Kingsburg, California, Daniel Core, of Sorrento, Florida, and Cameron Frazier, of Cincinnati, Ohio, all are tied for fourth at 4 under. Co-leader after the first round, Luke Armbrust, of Wheaton, Illinois, fell off the pace and is at 3 under. In all, 16 players are under par. Jake Beber-Frankel experienced an unforgettable moment Wednesday when he aced the 202-yard, par-3 fourth hole with a 4-iron. Despite shooting 69, Beber-Frankel missed the cut at 5 over. Trying to become the first player in 77 years to successfully defend his title, William Mouw, of Chino, California, is 2 under after rounds of 71-68. 72-hole stroke play event open to male amateur golfers who are at least 16 years old and not older than 19 by the end of the tournament. Entrants must have an official and verified handicap index not exceeding three strokes. Field maximum of 156.